The first juvenile falcon that fledged from the nest and ended up in rehab shortly after fledging was found walking on Water Street this week and is back in rehab. A good Samaritan noticed the fledgling in the street and bravely picked up the bird and drove it to the Kalamazoo Nature Center. The staff there knew what they had in hand, and brought the young falcon to Wild Animal Rehabilitator, Sharron Butler. The bird is doing fine and eating well. It most likely flew into something and was temporarily stunned when it was found in the street. Hopefully he will be ready for release shortly after the July 4th holiday. We are grateful to all the falcon watchers who help to track the birds and to those who respond when they see one of the birds on the ground. Great citizen response has helped to get these birds out of harm's way during this "Flying 101" semester. Rebecca makes it looks so easy, but there is a lot to learn and master before these youngsters graduate! 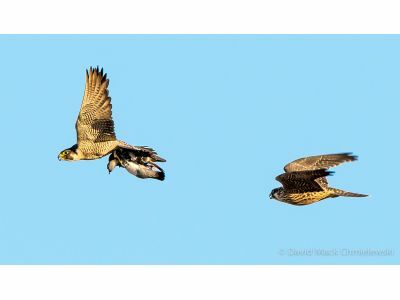 It was great to see Rebecca flying with a pigeon in her talons and three juvies in pursuit today. Kewpee visits the nest box daily and hangs out on the edge, catching some morning sun. If your timing is right, you will see him on the nest cam.